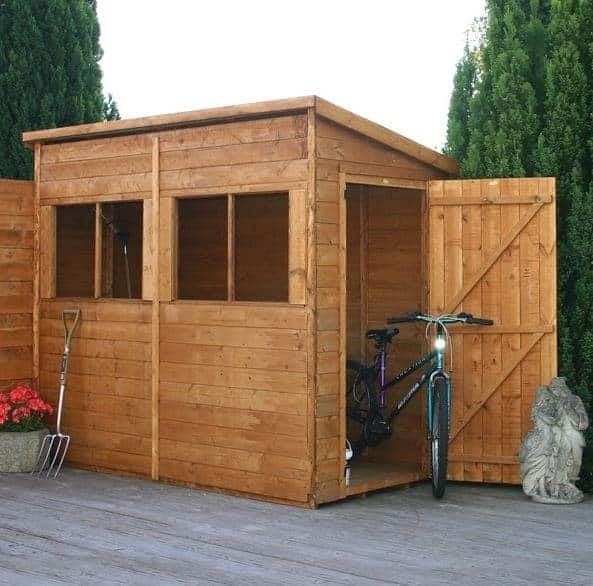 This superb, uniquely designed pent shed comes with an array of useful and practical features. Large styrene glazed windows provide the main focal point on this building, helping to ensure it benefits from plenty of natural lighting, all year round. What we really like about this shed is its completely modular design. This means it comes with interchangeable panels which can be installed any way you like. For example, the door can be assembled on the front, rear or even the sides of the building. You can even alter which way the slope runs on the roof. 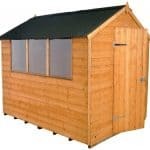 This unique customisable design gives you ultimate flexibility to build a shed which exactly fits your needs and preferences. Another plus point is the tongue and groove floor. It’s actually uncommon to find this size shed with a solid, thick floor. Usually to save costs the manufacturers supply solid sheet materials. As this one comes with a 12mm tongue and groove floor, it can hold the weight of heavy storage and you don’t necessarily have to upgrade. It is worth noting that this shed can also be teamed with the 8×4 lean to greenhouse. This enables you to create a fantastic potting shed and adds extra versatility to the building. Comes in an unpainted finish which may not be to everybody’s liking. 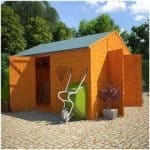 However, you can easily paint the shed or make use of the coloured treatments available. This is a wooden tongue and groove garden storage shed with a difference. It offers a completely flexible and changeable design, allowing you to alter the structure to fit your needs. It also comes with a pent design, making it a great choice for gardens with height restrictions. The strong floor and generous size of the building also makes it an ideal workshop. The building’s height is the first thing you really notice. 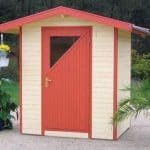 Pent sheds generally come with a taller front and a shorter back. As this one comes with a changeable design, you can alter the roof, instead making the front shorter than the rear. The height of the doors is pretty standard, but the width is a little wider than a lot of other shed doors. You’ll typically find most doors measure up to 0.75m wide, so the little extra on this building provides you with a little extra entry space. This actually makes a big difference when it comes to transferring your storage in and out of the building. 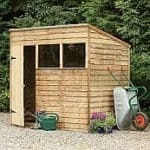 The depth and width are fairly compact, making this a great shed for any size garden. The type of construction used on the roof and floor of a shed is a huge giveaway to its quality. So we’re pleased to see this building comes with a tongue and groove floor. Often you’ll find to save costs, manufacturers use solid sheet materials inside the building. Whilst these do mostly provide adequate support, it can cause problems if you want to store anything heavy. Thanks to the tongue and groove construction, this shed is capable of storing whatever you want and it guarantees exceptional longevity. The roof is built with 8mm Eco and is covered with heavy duty mineral felt to protect against rot. Designed to really last, the shed is made with Shiplap tongue and groove style cladding. 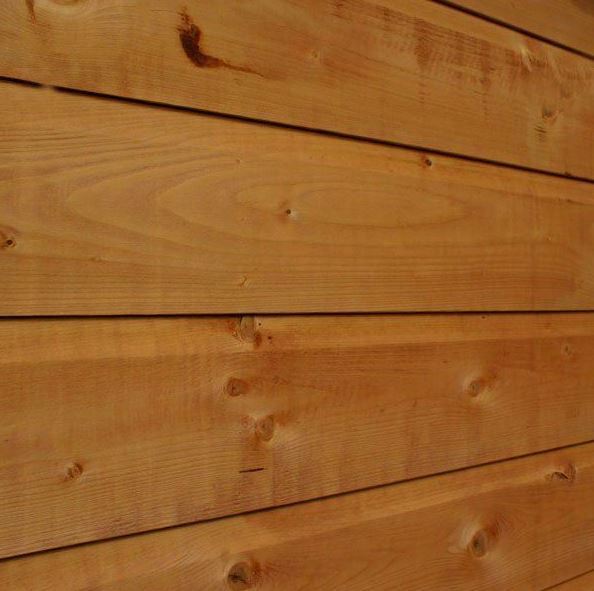 In the manufacturing industry, Shiplap is considered a leading, premium type of cladding used on high-end buildings. The panels are built with an incorporated groove which directs rain away from the shed, helping to boost longevity. It also gives the shed a stylish design, offering a smooth, flawless finish. The thickness of Shiplap can vary between manufacturers and here Waltons have used 12mm thick cladding. This is standard, but does offer a fantastic sturdy design. As well as the benefits you get from the premium Shiplap panels, the shed also offers the benefits of tongue and groove style cladding. Specifically, the building boasts a great expansion gap and easy installation. At one end of the panels there is a groove, whilst on the other is the ‘tongue’. This basically means the panels slot easily together, creating a solid interlocking design. The expansion gap also plays an important role, ensuring the building remains stable if any changes occur within the timber because of moisture or heat. Seasonal changes in the UK can bring quite dramatic alterations in moisture and temperature and this in turn can affect the wood. However, the good news is that Shiplap is very resistant to warping, unlike overlap. So overall the shed has fantastic protection all year round. Inside the building, Waltons have added 28mmx28mm rounded framing. The corners have been double framed not only for added stability, but also to maintain a moisture-resistant barrier. 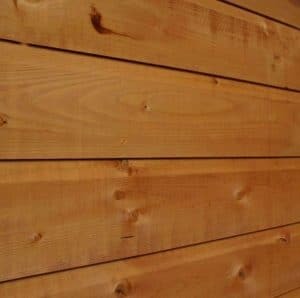 One of the best benefits of Shiplap tongue and groove cladding is that it is much stronger than overlap. This means that whilst it does still need to be treated, you won’t need to treat it as frequently. Of course, we should point out that this will depend upon which treatment you choose. Walton’s give you a free tub of Golden Brown treatment. This is a water based treatment that has been resin enriched. Water treatments are often chosen because they are cheaper and come in a wider choice of colours than spirit treatments. However, they will usually only provide protection for around one year. This is because they work by forming a barrier on the surface of the timber. It’s a strong barrier, but it will get worn down by the changing weather conditions throughout the year. That’s why, if you want to avoid annual treatments, a spirit based variety is recommended. Spirit treatments are a more advanced option and they penetrate into the timber, forming an internal barrier as well as one on the shed’s surface. So the building is left with a much stronger resistance against the elements. As with everything, the quality of spirit treatments does vary so be sure to choose a high quality preservative from a well-known manufacturer. If you take the time to maintain the shed with regular treatments as required, it will be protected by the Walton’s 10 year anti-rot warranty. You’ll find some sheds of this size do come with double doors, but this one has just one. However, this is to make room for the 4 large windows included with the building. The door also has a wide design, ensuring you still benefit from more than ample access to the shed. No matter what you want to store, there is plenty of room to manoeuvre bulky, large possessions. We also like that the door has been braced. This gives it a higher quality, longer lasting design and it won’t sag even with heavy daily use. The windows are a highlight of the building. Not many sheds of this size offer 4 windows. The benefit of this is that they supply a huge amount of natural light into the building. So if using it as a place to work, you won’t need to fork out for an electrical pack. Of course an electrical pack could still prove useful if you need to power small appliances and tools. However, to save money we’d recommend using battery powered tools if required. As it boasts thick, strong cladding, the shed does offer a good amount of natural security. The only thing we’d suggest is adding a strong padlock. This will reassure you that all of your valuables will be kept safe and secure. 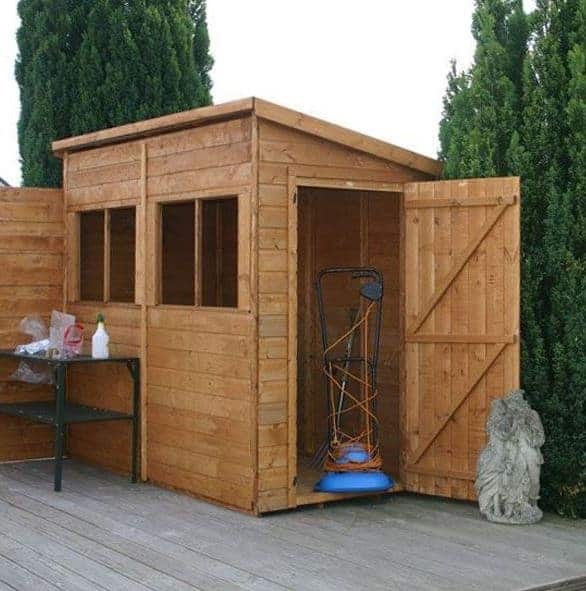 Privacy isn’t something you’ll benefit from with this shed, but there are ways to improve that. For example, you could install curtains, blinds or nets. Netting would be a particularly good option as it will still allow natural light into the building. One of the things we are most impressed with regarding this shed is its customisation options. Not only can you spend additional money customising the floor, walls and roof, but you also have a number of ways to customise the shed for free. The modular design of the building basically means you can change the position of the windows, door and you can even choose which way the roof slopes. As you can see from the picture, the door has been fitted on the side of the building, with the windows at the front and the roof is sloping towards the rear of the shed. We really like this particular design as it gives the building a more unique look compared to most standard sheds out there. However, if you’re building the shed next to another building, you can choose to add the door to the front and move one of the window panels to the side. This flexibility is by far one of the shed’s leading stand out features. You’ll notice there is a distinct lack of extras available and we like that as it means you don’t need to spend a fortune on upgrades. There’s the extra strength floor support pack which is something we would recommend if the floor of a building is constructed with solid sheet materials. As this one comes with a tough tongue and groove floor, you don’t really need the extra support floor pack. The only other available extras are the Draper accessories. These are a collection of tools designed by Draper, a leader in the DIY sector. If you’re using the shed as a work space then tools such as the cordless rotary drill and aluminium step ladders may be worth considering. There’s nothing to fault about the quality of this building. Everything has been created to an incredible standard, giving the shed a strong, flawless finish. As almost the entire building benefits from tongue and groove construction, you’re guaranteed an exceptionally long lasting design. 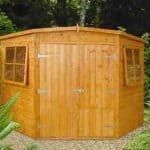 It does require treatments to maintain its water resistant benefits, but on the whole this is a very tough little shed. Thanks to its height and thick walls, the shed offers an excellent amount of storage space. You can add shelving and hooks to hold tools and equipment and you won’t have any issues storing taller objects. The floor is also strong which means it is ideal for heavyweight equipment. You are supplied with everything you need to construct the shed and the instructions have been presented in a clear, easy to follow manner. It will take a few hours to assemble and with 2 people you should find it a quick and straightforward task. 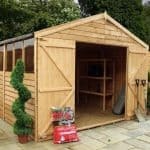 The ability to increase the amount of storage via shelving and the exceptionally strong cladding help to give this shed great value for money. Even the money you need to spend on regular treatments is paid back through its 10 year anti-rot warranty. Final Thoughts: This is a brilliant, unique storage shed which gives you the ability to alter its design in order to best suit your needs. The large styrene glazed windows offer an exceptional level of light into the building, whilst curtains or a blind can be installed to protect your privacy. The pent roof provides excellent water drainage, helping to protect the shed against rot. A large single door is secured with a pad-bolt, preventing the doors from opening in blustery winds. If you add a padlock, it acts as a great thief deterrent. Overall we’re impressed with this shed and love its interchangeable panels.